As of now I’m sure that you have heard whom the first three picks for the Los Angeles Kings were in the 2014 NHL draft. If not, good thing you are about to read this article. The kings were set to choose 29th overall this year because of the whole New Jersey Devils situation, and drafted the Swedish left winger Adrian Kempe. Kempe was ranked 6th overall amongst European skaters going into the 2014 draft in Philadelphia. He currently plays for MODO in the SHL, and has one year left on his contract. The player that Kempe can be compared to would be Magnus Paajarvi of the St. Louis Blues. Kempe is a speedy player who is strong on the puck, tenacious on the forecheck, and similar in style to Paajarvi. Going into the draft Kempe finished with 45 games under his belt in the SHL this year, recording five goals and six assists. 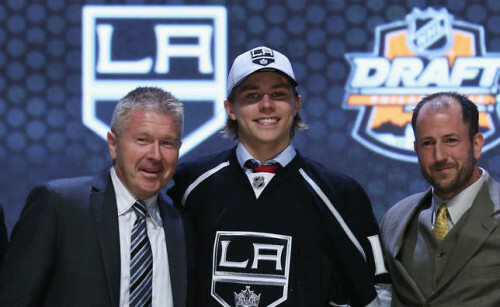 After being drafted by the Kings, Kempe took right to twitter showing his excitement. “So proud to be selected by the best team in the NHL”. The power forward was then asked to describe the type of player he was in his own words, saying “I think I’m a big, strong player, a good skater. I think that’s my biggest strength – I’m a really good skater, so that’s what I’m going to bring to the LA Kings”. The Third pick the Kings had this year was the 60th overall and chose to use it on Finland’s Alex Lintuniemi. Lintuniemi is currently under contract with the Ottawa 67’s. Alex had put up okay numbers in the OHL this past season, recording 17 goals and 21 assists in 68 games played. Although the Kings have drafted some top prospects don’t expect to see them playing for the Kings next season. According to sources they expect to see these guys playing at the beginning of the 2016 season.